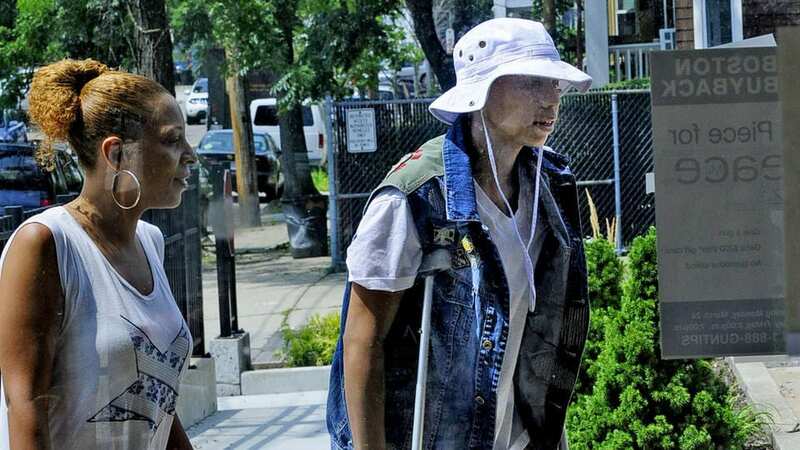 Photo: Stepping forward – Sheena Lopes and son Damone Clark arrive at a Dorchester police station to meet with Boston cops who are donating $5,000 toward Damone’s battle with cancer. Photo by: Ted Fitzgerald. Until yesterday, Damone Clark had never set foot inside his neighborhood police station, Dorchester’s Area C-11. He was too busy doing other things, like singing in the All Saints’ Choir of Men and Boys, or playing basketball, or spending whatever free time was left at the Dorchester Youth Collaborative, doing homework and writing plays under the watchful eye of his mentor, DYC’s founder, Emmett Folgert. Yesterday, just before noon, it was Folgert who drove Damone and his mother, Sheena Lopes, to the police station. He passed a pair of aluminum crutches to Sheena and waited patiently as her 15-year-old son gingerly eased his lanky frame out of the car. Chemotherapy drained just about all of Damone’s energy, but not his spirit. His reconstructed knee — fashioned from steel rods that replaced the cancerous femur in his left leg — was agonizing. Nevertheless, the kid bore down on the crutches, masked his pain behind a wan smile and hobbled into the squad room of C-11. It’s fair to say for about a half hour yesterday, life inside a very busy police station came to a halt. Cops, past and present — Commissioner Billy Evans, former Superintendent-in-Chief Bob Faherty, the current Superintendent-in-Chief William Gross — all gathered in the squad room to let Damone Clark and his mother know they would not go through the fight of their lives alone. Shortly after the story of Damone Clark’s battle with a rare form of bone cancer appeared in this space a few weeks back, Cops For Kids With Cancer let it be known that they were stepping forward with a $5,000 check. The idea, Bob Faherty said, began some 15 years ago with a colleague named John Dow, a retired captain, who survived lung cancer and wanted to do something to help what he called “those forgotten families” who bear a very real burden in the shadow of a loved one’s struggle. That description certainly applies to Sheena Lopes, who was forced to take a leave from her job as a home health aide to care for her son. Sheena Lopes glanced around a room filled with cops who all looked like family. She was determined to be strong for her son, so she did not break down. But the gratitude in her eyes was only exceeded by a weary smile that seemed to edge out the pain on her son’s face.